5-HTP and tryptophan are not the same. 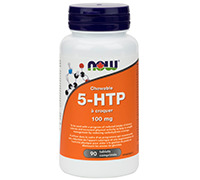 5-HTP is related to tryptophan, but is derived from a different source. The 1980 scare concerning the Japanese tryptophan was attributed to a large batch the Japanese produced that was contaminated during the fermentation and/or filtration process. The contaminant caused affected persons to develop symptoms of EMS (eosinophilia-myalgia syndrome). 5-HTP, unlike tryptophan, is now extracted from the seed of the Griffonia simplicifolia plant and is not produced via bacterial fermentation, virtually eliminating further occurrence of EMS. The contaminant believed to have caused the tryptophan contamination has not been identified as being present in 5-HTP. Suggested Usage:Â As a dietary supplement, take 1 VcapÂ® daily, preferably on an empty stomach at bedtime.Â Consider taking this product in combination with NOWÂ® Valerian Root, ReloraÂ® and Pantothenic Acid. Other Ingredients:Â Â Rice flour andÂ Cellulose (capsule). Contains no:Â sugar, salt, yeast, wheat, gluten, corn, soy, milk, egg, shellfish or preservatives.Â Vegetarian/Vegan Product.